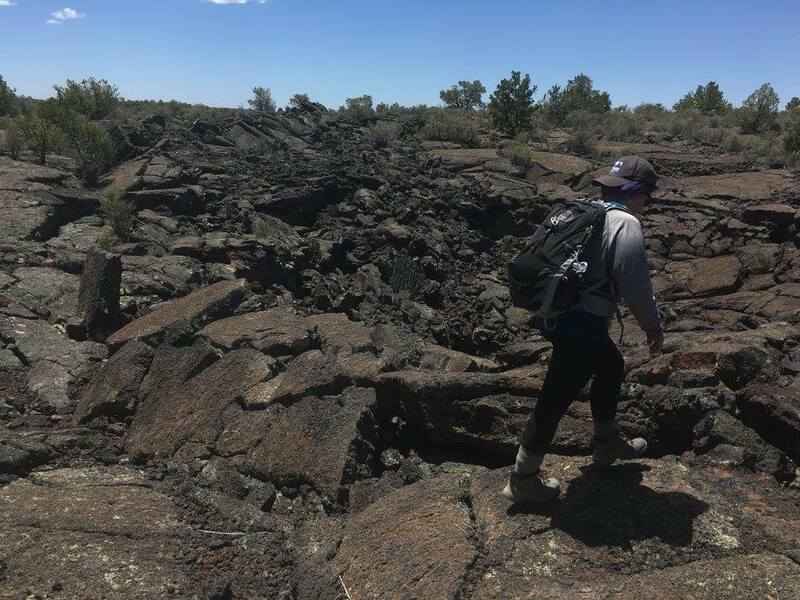 UTIG Ph.D. student Sophie Goliber jumped right into UTIG and the the UT Jackson School of Geosciences by volunteering to help plan Brown Bag Seminars and the Student Research Symposium. She is currently in her first year here at UT and we caught up with her to learn more about what it’s like to be a new student. What led you to study at UTIG for your Ph.D.? UT and UTIG have a great geology program and are really supportive of their graduate students. When I was applying to graduate school, I was looking at places where I could use my interest in multispectral remote sensing to answer questions about planetary ices, but I also wanted to strengthen my quantitative reasoning skills. It was really important to me to find a program that allowed me to find a project that aligned with my interests but that also challenged me to grow as a scientist. I joined Ginny Catania’s glaciology group in the fall 2017 and have begun to use image processing and computer vision techniques to explore terminus variability of the Greenland Ice sheet. I was involved in lot of different research projects at the University of Buffalo, where I received my undergraduate degree, but they all used remotely sensed imagery. 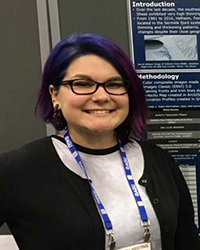 I worked with Landsat data while working in the Remote Sensing and Glaciology Lab at the University of Buffalo with Dr. Beata Csatho and began to really appreciate the knowledge that could be gained from looking at time-series data. Changes occurring over different timescales is how we are able to draw a link between observations and processes. A single image of glacier isn’t going to tell you much about how it behaves but once you get a look at it throughout time then you really get an understanding for how that glacier interacts with its environment. You jumped right into volunteering across the Jackson School of Geosciences (JSG), by helping plan the student research symposium and spearheading the UTIG brown bag seminars – why did you want to get involved in these? I have always enjoyed getting involved in any organization I am a part of. I think it’s the best way to get to know the other people and you make connections you wouldn’t have otherwise. The symposium, brown bag, and UTIG ice reading group were very important to me because I think collaboration and communication are really important in the academic community. These programs allow for people to share their science and get feedback from the JSG community. They also allow students to get practice with poster and oral presentations so they feel more comfortable at larger meeting and conferences. You’re a first year graduate student, what does your schedule look like? Classes and reading! There are so many options for classes at UT, so sometimes it’s hard to fit in everything I want to learn about! I was involved in glaciology and remote sensing research previously, so I am familiar with the literature, but reading enough to be totally comfortable with the language and methods used in the field is really important. I also try to make time for non-academic activities around Austin, like climbing or concerts. What is your favorite part so far about studying at working at UTIG? The breadth of research at UTIG is really impressive. There is so much collaboration between groups, which leads to some cool science! The graduate students are really supportive of each other, too. It helps to have other people in the same boat as you to talk through ideas and issues. What do you want to accomplish during your time here (besides graduating of course)? I’d like to have greatly improved my communication and teaching skills by the time I leave UT. With all the knowledge I will have gained here, I think it is my responsibility to be able to effectively share that knowledge to help advance future scientific research. I also really want to figure out how to make the Taco Deli’s Salsa Dona and Taco Joint’s chipotle sauce. What advice would you give to someone looking into graduate school? Look into programs and research groups that are enthusiastic about their research and allow you to explore your interests. Advisors that are open to new projects and collaboration across fields are great because, in the end, everyone learns something new. Also, ask the graduate students at the program if they are happy there. The program you are applying to may have tons of money and some cutting edge research, but if you’re going to be miserable for five years, is it worth it? Most schools have great resources but make sure you’ll have a good support system, too. What’s one thing you’ve learned in your first year? Ask more questions. The ice reading group has adopted the philosophy of “the only stupid question is the one you don’t ask” in our meetings, and I think we have all benefited from it!